So at #65 Skindred had an entry with "Kill the Power", which while it was actually the second single off "Kill the Power" the album, it was technically the main promotional single. 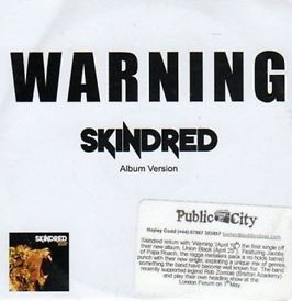 With "Warning" we now have the main single off the previous album which was "Union Black". They're both great singles and based on their entries on this list you can see that I do ever-so-slightly prefer "Warning". It's hard to point to why that's the case. If you've heard Skindred before then all you need to know is that they are both worth your time and if you haven't heard them, give them a listen. If you haven't heard Skindred before, listen anyway! They're a great reggae-metal band and sound like nothing else out there at the moment. Benji is an incredible talent in the mic and, being from Wales makes Skinded that much better. That's all there is to say really! If you missed #53 go here.